And this wraps up the daily reports! Only a month late! After eating rolls and fruit from home for most of the con, we went out to breakfast at the Broken Yolk Cafe. (I keep wanting to type Burnt Toast Diner.) They’d decorated for the convention — including thematic T-shirts on some of the servers — had good food (more varied, if not as good as Cafe 222), and were very busy, but we managed to beat the rush. 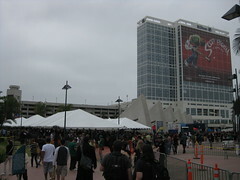 Then we walked through the streets of San Diego to the convention center one last time. I figured there would be a line for Castle (especially since they had the entire cast present, and Nathan Fillion by himself is a big draw at Comic-Con). I wasn’t expecting it to run down the hall from the larger 6 rooms, out onto the balcony, zig-zag a bit under some tents, then head back along the convention center and wrap around the end, next to the gigantic air conditioners. At least the morning cloud cover hadn’t burned off yet, so we weren’t out in direct sun. It took a long time before the convention started letting people in, but when we finally got to the front, I decided I’d head out and make Sunday the day I finally really explored the main floor, while Katie went in for Castle and then Merlin. The staff directing traffic didn’t seem to know what to do with someone who left a line, though, and treated me as if I was trying to cut through it. This was the only time I ran into this kind of problem, fortunately. The rest of the time, traffic management was a lot better than it has been over the last few years! Once I shook that off, I headed to Artist’s Alley. I hadn’t quite made it there yet this year, probably because it was shoved all the way to the far end of the convention center. 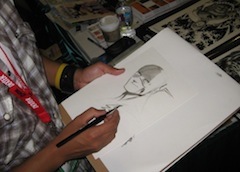 My goal: to find Flash artist Francis Manapul and ask him for a sketch. There were only about five or six fans ahead of me, but it takes time to do a sketch (unless you’re Sergio Aragonés), so it took the better part of an hour. Around noon, I started my final exploration of the exhibit hall, the first systematic tour I’d attempted all weekend. The plan was that I would start at one end and work my way to the other, where I’d meet Katie and we’d head out for lunch and then home. I checked out displays by artists and toy sellers, skimmed the movie and game studios, worked my way through the comic book publishers’ area, and finally decided to call it quits with a good fourth of the floor left to go, figuring I’d covered that part well enough on my earlier passes. 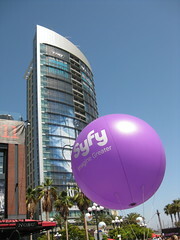 Then a quick stop for coffee, and we were on the road, returning from another year at Comic-Con! 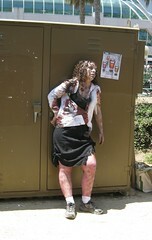 This was Sunday, July 25, 2010. 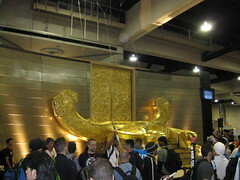 So, it took a lot longer than I intended, but this wraps up my coverage of this year’s Comic-Con International. Well, almost. We’ve both got notebooks with funny quotes, and we’ve only posted the ones from Leverage, “Twisting Genres” and “Once Upon a Time (Epic Fantasy)” so far, so you can expect a humor post or two at some point. Other than that, we’re done! 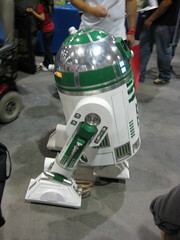 »Full index of Comic-Con 2010 posts and photos. 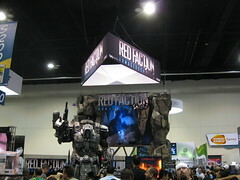 This entry was posted in Conventions and tagged Castle, Comic Con, Comic Con 2010, San Diego, SDCC on August 22, 2010 by Kelson. Yeah, I’m still working through this report. Here’s hoping I can finish before it all completely blurs together! 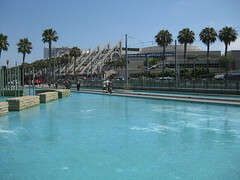 Follow me back a few weeks, to Saturday, July 24 at the San Diego Convention Center. As usual, Saturday was the big day for big presentations. Katie got up early to wait in line for Harry Potter (and incidentally Sucker Punch and Green Lantern), figuring on taking the first shuttle to the convention center…which didn’t show up. After 30 minutes, it became clear that there wasn’t going to be room for everyone on the shuttle when it finally did show up, so she made the trek on foot. She picked up a spot on the lawn, out where they had canopies (not that they needed them with the morning gloom). I slept in a bit longer before heading down to stand in line for Leverage, which was, well… Leverage was an experience in its own right. Afterward, I took the opportunity to do a little exploring over by the Hilton now that the sun had come out. 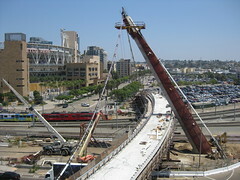 Mostly I checked out the views of the convention center, but I also went up to the top of the parking structure to get a look at the pedestrian bridge that San Diego started building two years ago. That’s where I found a portable cell phone tower, showing that at least one network had made an effort to increase coverage for the event. 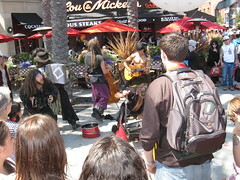 After another brief pass through the main floor, I headed out into the Gaslamp again. My plan was to go through the Scott Pilgrim Experience, especially since I’d heard that Saturday was the last day, but the line was hideously long. The line for “Stuff” wasn’t long at all, however, and it took me about two minutes to pick up a T-shirt and some download codes related to the soundtrack. So I wrote off the Scott Pilgrim Experience (Cinematical describes what I missed) just like I’d written off the Hall H Experience, and kept going. Though I should have stayed a little longer: they were just setting up the truck with free garlic bread as I was leaving! I had some time before Katie and I planned to meet at a shawarma place for lunch, so I figured I’d get some iced coffee first. 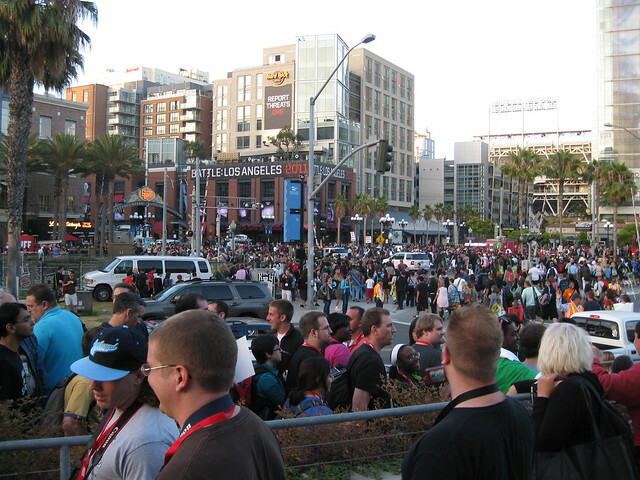 The convention always spills out into the city. 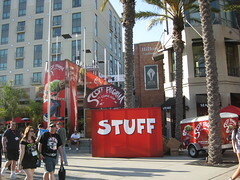 Even beyond the Gaslamp crush of official and unofficial offsite activities, there are ads and banners everywhere…and convention attendees walking to and from restaurants, hotels and parking lots. 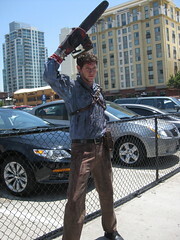 At one point I walked by a couple dressed as Wonder Woman and Ash from the Evil Dead movies. Wonder Woman was drinking coffee or a smoothie or something, but I asked Ash to pose for a photo. I turned around and saw a couple dressed as Drusilla and Spike from Buffy the Vampire Slayer on the other side of the street. 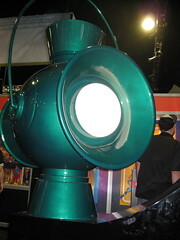 So we met up at lunch, showed off swag (my Leverage: Mastermind shirt, her Harry Potter: Undesirable No.1 shirt), caught each other up on what we’d missed (the Green Lantern oath, Parker’s thoughts on Comic-Con, what the heck Sucker Punch is about), and showed each other pictures. 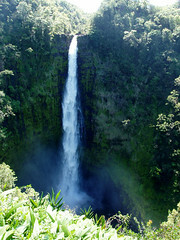 Digital cameras have really changed the immediacy of photo sharing! With no specific plans for the evening, but memories of Thursday’s cattle drive, we left about a half an hour before the floor closed so that we could catch a shuttle before the rush. We didn’t really need to, since the driver waited until it was full anyway, and didn’t pull away until almost 7:00. On the plus side, we spent that time in cushy seats instead of standing in a crowd, shuffling along. 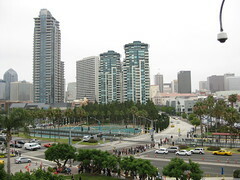 On the drive back to the hotel, we first heard vague rumors of the stabbing in Hall H earlier in the afternoon. It was the most low-key experience I’ve ever had at a Comic-Con. And that was not a problem! This was Saturday, July 24. Next: Sunday. Castle, Merlin and Artists’ Alley. 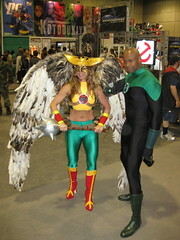 This entry was posted in Comics, Conventions and tagged Comic Con, Comic Con 2010, No Ordinary Family, San Diego, SDCC on August 21, 2010 by Kelson. I never quite made it this year, though I came close on Saturday before lunch. I ended up walking by a coffee stand set up outside Lion Coffee. Two years ago, the site had been a Starbucks, before the chain started mass-closing their stores. (Now they’re only on every other corner.) 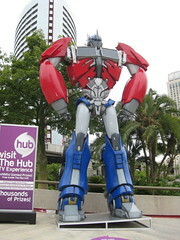 Last year, Lion was in the process of converting this location, but hadn’t actually opened yet. 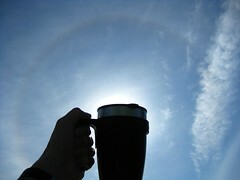 Shrewdly, they had set up a table outside, selling coffee from urns and drinks from a cooler. This year, they were open, but had set up a table around the corner to catch people walking by. It worked. They didn’t have any iced coffee outside, but the clerk handed me a dollar-off coupon for asking, and I ended up getting a really good iced mocha inside! 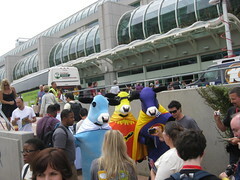 This entry was posted in Conventions, Food and tagged coffee, Comic Con 2010, San Diego on August 19, 2010 by Kelson. 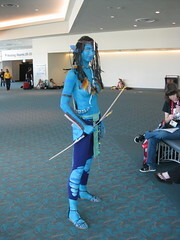 I used to go to Comic-Con mainly for the exhibit hall. That’s where the comics were, after all, as well as the publishers, writers and artists. I was never really big on buying other collectibles, but there was always interesting stuff to see. So if I wanted to get a comic book signed, or look for back-issues, or take a look at the black-and-white previews that DC used to bring of their upcoming books, that’s where I’d be. Over time, though, I filled in my back-issue collections. Ebay and Mile High Comics took care of any new/old discoveries. As the exhibit hall expanded to the point that I couldn’t really explore it all in a single day, I also started to get more interested in watching the events and presentations. Switching from a one-day trip to a four-day trip drastically changed my experience, because for the first time in years, I could do both. Looking back at this year’s con, though, it almost seems like I was avoiding the main floor. I explored a few small areas, and when I had extra time, I’d walk slowly through on the way from one thing to another, but until Sunday, I don’t think I spent more than an hour at a time in the real heart of the convention. 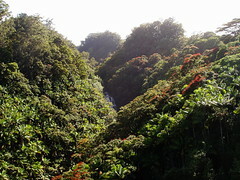 I think a lot of it is a sense of familiarity. There are always a lot of new displays, and the mix of costumes changes every year, but a lot of enough elements stay the same from one year to the next. DC’s booth looks largely the same. 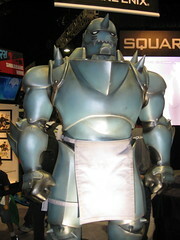 Square-Enix still has that Fullmetal Alchemist statue from four years ago. 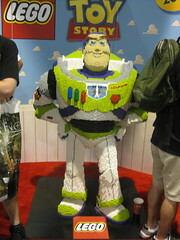 The LEGO Buzz Lightyear is still cool, but I saw it last year. At one point I walked past a line of people in the middle of one of the larger aisles, and wondered what they were waiting for…until I realized they were waiting for a signing at a bookseller’s booth. That booth was in roughly the same spot and looked exactly like it did last year when I waited in line for a Peter David signing. It was actually kind of eerie — and it was hardly the only booth that seemed to have stayed put all year. In a sense, the exhibit hall is starting to feel like a city, with an illusion of permanence and (dare I say it) continuity from year to year. You can’t explore an entire city in one visit, and if you come back on any sort of regular basis, you don’t take a general city tour every time. You start developing regular hangouts, like the restaurant or park or bar that you visit every time you’re in town. You specifically look for things you haven’t already seen. And then you ignore a lot of what you’ve seen already. So I hit my hangouts: Studio Foglio, DC, Sideshow. I did some exploring, making a point to check out the small press, webcomics, and artists’ areas. But those aisle-by-aisle sweeps are a thing of the past. 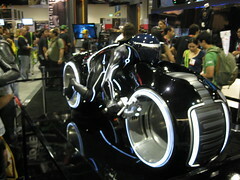 This entry was posted in Comics, Conventions and tagged Comic Con, Comic Con 2010, SDCC on August 10, 2010 by Kelson.